Have you heard of sense verbs before? Perhaps no but it is simple because I am sure you have heard of sense organs. 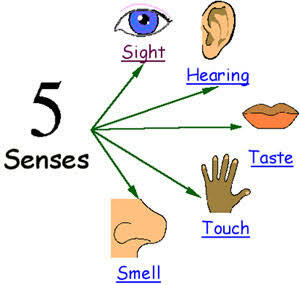 If you actually entered your Integrated Science and Biology Classes, not minding how the teachers looked, you should know that we have five sense organs: nose (to smell), ear(to hear), tongue (to taste), skin ( to feel) and eye (to watch). Did I get it? Yes, I got it! I just mentioned the sense verbs together with the sense organs. The sharp guys would notice it. If you didn't, recheck it before proceeding. Today we are going to look at some sense verbs in English. This lesson will help you understand how to use these very common verbs correctly. to feel : I feel sick! to look : Tammy looks nice in his new dress. to sound : Your voice sounds tired. to see : I can see a bird in that tree. to hear : We heard the football fans shouting. to taste : I think indomie noodles taste nice. to smell : Roses smell beautiful. to watch : At the weekend we normally watch a film together. • This meal tastes delicious, thank you. • That noise sounds horrible. • The food smells bad. Throw it away! • She looked too tired to go out. • You look so like my father; it’s unbelievable! • This perfume smells like vanilla. • You look like a clown dressed in those clothes. • That sounds like water dripping on the floor.